Something interesting happened when I changed my game from Flash into HTML5. Since I didn't have any of the OGG files ready, I imported a dummy OGG files (random selected OGG I had from a previous game). I intended to use these placeholder OGG sounds just for testing, until we convert all the MP3 into OGG in Audacity. So now when I had both green check marks ticked (see picture below), I tested the HTML and thought it would play some random placeholder sounds. But it did not! - It plays all the proper sounds, just like they are MP3. 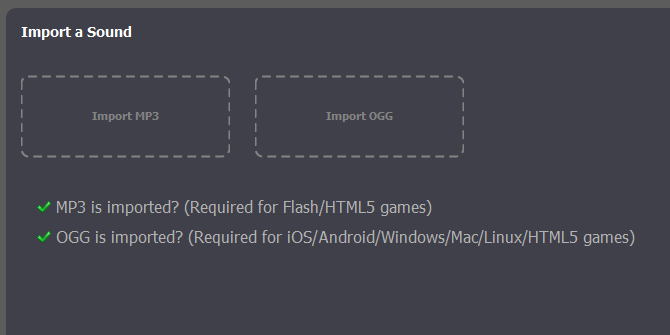 I am not sure would this also work when published for PC or mobile, but as HTML works without having each individual OGG file created. I tried both locally and uploaded to a Flash game portal, works both in Chrome and Firefox. This is not a real question, but I thought it might best fit in this board. Please move elsewehere if needed. Ohh! I get it. Thanks!!! Ah interesting, i didn't know different browsers use different formats.